It’s not a UK tradition, but in parts of America (and maybe other places too? ), black eyed beans and greens are eaten on New Year’s Day to bring luck for the year ahead. I decided to use the tradition myself and I used a recipe from the Cafe Flora book to do it. 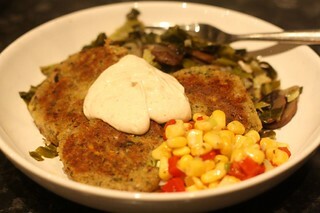 I have made these fritters before but not on New Year’s Day and not with the accompaniments – smoked greens, cayenne aoli and corn salsa. The greens contained smoked mushrooms which took them to a different level, and the corn salsa and aoli lifted the flavours. I’m not sure this meal will actually bring much luck but it was a tasty start to the new year! This entry was posted in Cafe Flora by efcliz. Bookmark the permalink.